Good quality products don’t have to break the bank. What makes a great line for me is attention to detail with not only the actual product but the packaging. I know it’s not quite holiday buying time yet, but this MOR line’s products score high points in the product and packaging department and are totally affordable. Neroli Clementine Body Butter ($16/8.8oz) – formulated with skin-loving ingredients like olive oil, grape seed oil, Shea butter, vitamins A & C and Aloe vera, among others. It smells like fresh oranges! Both and more, or rather Mor, @ morboutique.com. Not of fan of sticking my fingers into my balms, this MOR COSMETICS Lip Macaron is the perfect circumference to swipe directly from the tin to my top lip and then bottom lip. They call it a lip gloss but I’d call it more of a lip balm as feels more like one and contains vitamin E and I don't know many glosses that contain vitamins. And packaging is so important when it comes to luring a woman to your product and MOR fully understands this! Isn't it fun? Available in 7 scents and show here in Lychee Flower. $10 @ morboutique.com. Give ‘em something different this season. I mean, how many bottles of wine can your host get? Our favorite gifts to give and receive has to be soaps and MOR COSMETICS Emperor Soaps ($14 @ morboutique.com) are some of the best out there. The detailing on the packaging of bygone days really makes you feel like you are gifting works of art. 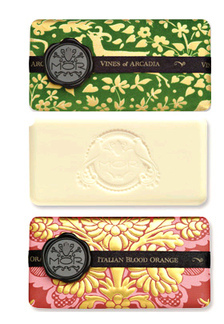 Each soap inside is triple milled and available in twelve different scents like Black Cherry Plum, Italian Blood Orange or Snow Gardenia.